Bainimarama and Khaiyum have no intention of giving up power and control over Fiji. Their actions all point to this fact. To give up power means certain arrest and imprisonment for the both of them. It could also mean death for them. So they are doing everything and anything to remain in power. However, there are still a number of people who believe that the illegal 2013 constitution and the 2014 elections will provide them with the opportunity to remove Bainimarama and Khaiyum from power. This is a deluded school of thought. The only way to remove these two criminals is by an uprising by the people. But who will lead this uprising? A few have tried but support did not eventuate beyond a few brave souls and words - so the "warriors" wait for the 2014 elections in the deluded belief that they will just vote Bainimarama and Khaiyum out. It is not that simple! Bainimarama and Khaiyum have the guns and the sadistic military goons to enforce their will. This includes staging another coup should they appear to be loosing the 2014 elections. This outcome, however, could bring unwanted pressure from the international community. 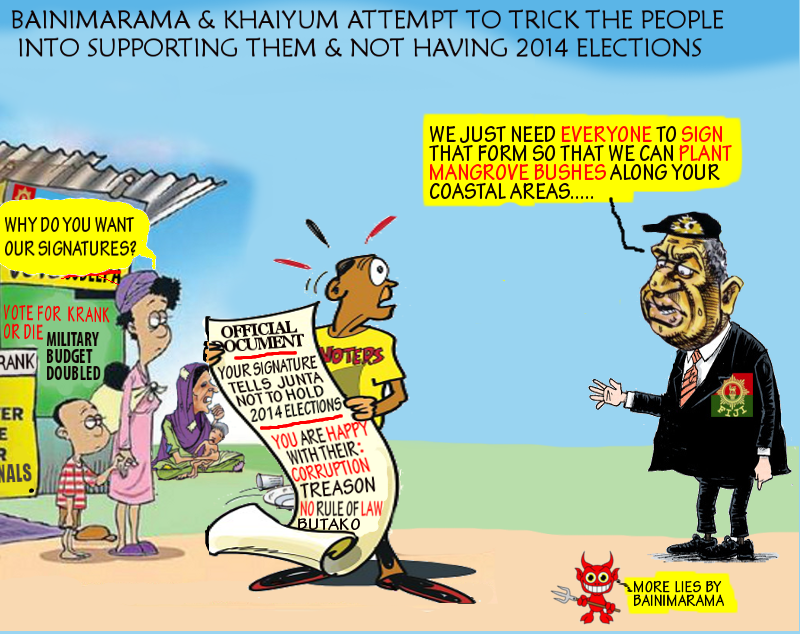 So in the meantime, Bainimarama and Khaiyum are searching for and trying different ways to trick the people into saying that they support the dictatorship and do not want elections in 2014. Kacivaka Na Dina blog reported that the Bainimarama Regime was circulating forms to villagers and the people across Fiji. The forms were cunningly presented in an attempt to get the people to unwittingly sign a petition calling on the illegal Regime not to hold elections in September, 2014. Apparently, local Chiefs had also been threatened into supporting the petition. These tricks will continue until Bainimarama and Khaiyum are voted in, by hook or by crook, or they install themselves in power in yet another coup. To date Bainimarama and Khaiyum have not kept any of their promises to the people. They do not follow any rule of law and they do whatever they please, whenever they please and however they please. So the chances of Bainimarama and Khaiyum placing any sincerity in their illegal 2013 Constitution and the 2014 elections is highly unlikely - unless it benefits them. The reality is that as soon as they realise that their party will not win the elections, then they will again move the "goals posts". They will continue to do this until they get the outcome they want. Just like what they did with the development of the constitution. They ignored the voice of the people and two world constitutional experts and imposed their own version without any further consultation with the people. The 2013 constitution and the 2014 elections are just a means to an end for Bainimarama and Khaiyum - to remain in power, out of prison and stealing millions from Fiji. But if this option fails then they will just conduct another coup. So waiting to cast your vote in the 2014 elections, if it happens, is not going to do the trick. Especially if other Dictatorships (China, North Korea and Russia) are going to be overseeing the elections. These countries are experts at rigging votes and falsifying results. Rise up at every favourable opportunity! For your homes and nation, rise up! For future generations of your sons and daughters, rise up! In the name of your Almighty God rise up! The guidance of divine God points the way. Follow in His Name to the Holy Grail of righteous victory!